The Televue Radian Eyepiece achieves optimum full field sharpness and freedom from distortion. Incorporates exotic glass types and fully multi-coated for maximum performance properties. The TeleVue Radian Eyepiece has an apparent Field of View of 60º. Offers an outstanding 20mm of Eye Relief in a 1.25" barrel size. 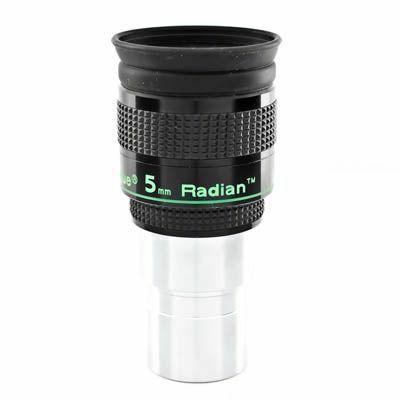 This TeleVue Radian Eyepiece is a 5mm focal length. By limiting the field to 60 deg. (a Radian = 57.3 deg.) and establishing a uniform 20mm eye-relief, TeleVue reworked the Nagler concept using the latest glass types to achieve optimum full field sharpness, freedom from distortion, freedom from ghosting (for critical planetary viewing) along with a unique adjustable eyeguard assembly which they called "Instadjust." Instadjust was developed from the need for proper eye position for non-eyeglass wearers. It is essential, since with Radian's long eye-relief, non-eyeglass wearers would easily tend to get too close to the eyepiece, resulting in vignetting the field, just as you would moving out from the exit pupil. The click-stop, Instadjust eyeguard permits fast, accurate positioning of the eye to the exit-pupil with maximum suppression of environmental stray light. Instadjust is topped off by a soft (for comfort and eyeglass protection) fold-down rubber eyeguard and protective cap. Usual Televue features such as full multicoating, blackened lens edges, parfocalization, and grip-ring complement the Radian line. With a reasonable size, weight and cost, I anticipate the Radians will set a new benchmark in viewing pleasure for any person and any target within the eyepiece focal length range of 3mm-18mm. 18, 14, 12, 10, 8mm models have just 6-elements. 6, 5, 4, 3mm have 7 elements.